Solid-State Data Transfer Unit USB and SD technology replaces obsolete floppy and ZIP DTU units. In 2009, Universal Avionics discontinued the production of the DTU-100, P/N 1406-01-X and Portable DTU-100, P/N 1407-01-1, because the internal zip disk drive technology was no longer supported. More information about this can be read in the Universal Avionics Service Letter, No. 2816, Revision A, dated February 25, 2009. Universal Avionics certified the Solid State Data Transfer Unit (SSDTU), P/N 1408-00-X and Portable SSDTU, P/N 1409-00-2 to replace the DTU-100 and earlier DTU products. The SSDTU USB and SD technology replaces obsolete floppy and ZIP DTU units. Universal supports DTU-100 units with databases available on zip disks and continues to provide product service when able. We strongly recommend that you update to the SSDTU at your earliest convenience. Any out of warranty service of the DTU units that requires the zip drive to be replaced is no longer supported. The SSDTU is capable of interfacing with up to eight Universal Avionics Line Replaceable Units (LRUs) including Flight Management System (FMS) Terrain Awareness Warning System (TAWS), and Application Server Units (ASU). 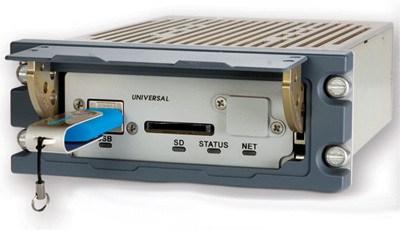 These data transfers are made more convenient using the SSDTU because the high-speed media ports are located in the faceplate and utilize a high-speed Ethernet connection. To accommodate a variety of aircraft configurations, the SSDTU is available in a fixed-mount and portable version. The upgrade to the Universal Avionics Solid State Data Transfer Unit is a simple installation and can be performed at any of Duncan Aviation’s Avionics Satellite locations. Dennis Kruse (LNK) and Melissa Raddatz (BTL) are avionics installation sales reps at Duncan Aviation's two full-service facilities in Lincoln, Nebraska (LNK) and Battle Creek, Michigan (BTL). They specialize in providing aircraft operators with the latest avionics installations information, including cabin entertainment, Wi-Fi installations and NextGen initiatives. Dennis and Melissa began their aviation careers in 1990 and 2007 respectively.